In the three buildings of the hotel, 181 air-conditioned, comfortable rooms are available to guests, of which 4 single rooms are (2 with balconies, 2 without balconies)15 twin rooms do not have balconies, 128 twin rooms are with balconies. There are 2 family rooms without balconies. Our 22 Superior suites have balconies and have seperate lounge and bedroom to promote relaxation in comfort. 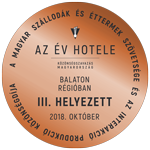 Our 3 Luxury and 7 Exclusive Suites are equipped with a kitchen in consideration of families, and the panorama from their balconies offers a fantastic view over the Balaton landscape. The living spaces are equipped with LCD TV and telephone, safe, hairdrier, minibar and air-conditioning. Additional beds can be placed in a significant proportion of the rooms, or they have three beds already. An extandable sofa which can be transformed into a fully adequate, comfortable bed can be found in the lounge of the superior, luxury and exclusive suites. For the little ones cots are provided for charge. The bathtubs do not work as massage tub! There is Wi-Fi in the whole hotel for free of charge. Smoking is not allowed in the rooms and suites, the living spaces are equipped with smoke detectors. 4 air-conditioned single rooms (16m²). From the balcony of the rooms there is view to the city and to Tamás Hill. From the balcony of the rooms there is a picturesque view to the lake and to the Peninsula of Tihany. These rooms are without lake view. 29 air-conditioned rooms (from 28 m²) equipped with shower, hairdrier, LCD Tv, dressing talble, bedside table, minibar and safe. From the balcony of the room there is view to the Lake Balaton. The room equipped for our disabled guests. 2 air-conditioned rooms (42m²) equipped with Biedermeier style furniture, LCD TV, dressing- and bedside table, minibar, safe. The bathrooms are equipped with shower and hairdrier. 22 air-conditioned suites (from 49m²) providing the option of separate accomodation for family members. 3 air-conditioned apartments (min.80m²) with picturesque view to the lake and to the harbour of the Hotel. 7 3rd floor apartments (90-110 m²) with panoramicbalcony are equipped with two separate bedrooms, lounge and two separatebathrooms: each bathroom has a shower cabin and bath.